Tom Landry, legendary Dallas Cowboys’ football coach, is known for his efficiency and innovation. The Landry seeks to live up to his legacy. At 8 feet long and only 720 pounds, a Landry can be pulled by any vehicle with a tow bar. Easily hand-maneuver it into a single parking space or through a disaster recovery situation. The hitch can be removed for both security and safety. Better than a trailer hitch grill, it's an entire kitchen! 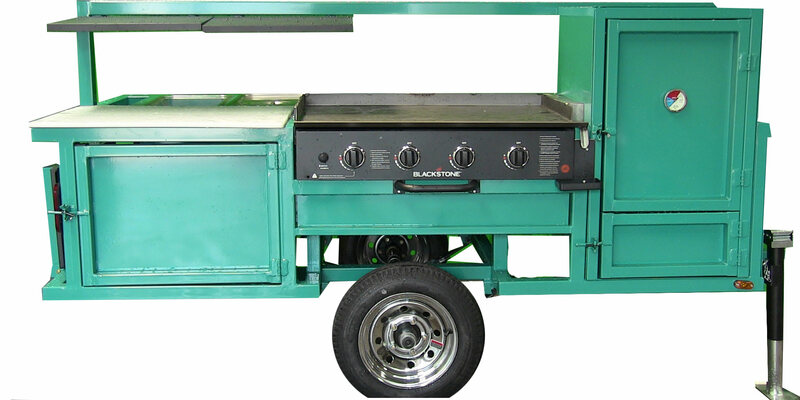 At only $4,470, you won’t find a similar price on a full-featured mobile kitchen with a griddle and a smoker. And with our lease-to-own program, we’re providing the opportunity for anyone to open a business, feed the hungry, or connect with the community. If you can flip a burger and load a woodbox, you can run a Landry. A single cook can feed hundreds of people in a day, making it easy to take shifts. Whether used in disaster recovery situations, to feed the homeless, or to make a profit, an OMG connects you to your patrons face-to-face. The 16-gauge steel vertical smoker has two built-in racks and room to add your own. Use it as a traditional smoker with wood, charcoal, or a mix of both. When used buffet-style, the line begins at the serving counter, moves across the steam table wells to the condiment holder, and finishes at the tailgate tray.